Carving the Black Granite at the stone factory was an experience I will remember. 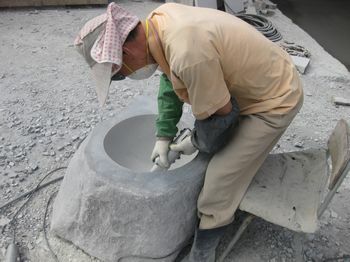 The stone factory is only one small but impressive part of the Gaewha Arts Park. The sheer size of the stones that are excavated from the local mountains is impressive as is the range of equipment assembled to work it. 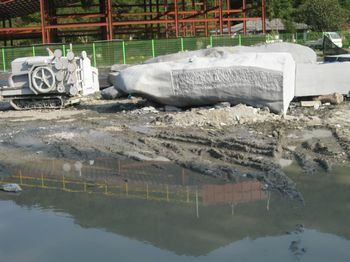 During my two days there a small radio controlled cutting machine on caterpillar treads made its way towards a huge stone which it set about cutting in two. The guy controlling the machine sat o a rock nearby and never got his hands dirty. The Koreans are noted for the quality of the big saw blades they make for cutting stone into slabs. Watching the blades crossing back and forth across the stone and effortlessly cutting deeper and deeper is quite mesmerizing. Massive stones were moved and positioned with ease by artisans using forklifts and hooks and slings attached to the overhead gantry. I had enough to do carving and shaping my 1.8 metre 130 mm thick slab without trying to carve a hemispherical hole in a natural stone. It was decided it was too dangerous for me to do anyway so the job was done by an artisan and he took a whole day to do it. It was a perfect job. The Art Park has a great restaurant which is entered though a large covered flower garden featuring tropical plants and ponds full of Golden Carp. I was treated to full Korean style breakfast lunch and dinner. Strolling around the Park it was amazing to see so many sculpture some of which were 10 metres high. The ‘Poets Walk’ winds through the landscaped area and reveals the work of many poets incised into the polished surfaces of numerous natural stones. Since my return to Yatoo Nature Art Centre, I have been flat out working to fine tune my installation ’Reflections’ making sure the base natural stone was level so the hemispherical basin carved into it can be filled with water. Should people chose to look into the basin they will not only see their reflection they will glimpse the sword/leaf dangling overhead! The Black Granite takes a wonderful polish but for this work I decided to go with a comparatively ‘rough finish’ straight from the diamond blade cutting tool. I polished this surface which highlighted the high points and gives an overall darker hue to the stone. To sign or not to sign. Mr Ko insisted that I sign the work which was all very well as the best place for a signature happened to be 4 metres up in the air. 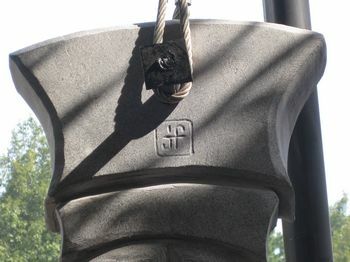 In addition the stone was suspended thus liable to move at the wrong time so using hammer and chisel was out. So I decided to use my electric Dremel Rotary tool. After some minor technical hitches such as plugging the tool in but the tool failing to work, I managed to sign the work using a character created for me by my son Alexander.